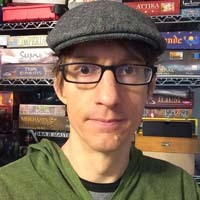 Dominic Crapuchettes is best known for his popular party game Wits and Wagers, but that ought to change with the 2nd edition release of Evolution. This is a two to six player title that ranks among the most thematically resonant card game designs that I’ve ever played. I’ve become quite fascinated with how each session results in the creation of a unique biosphere in which animals defined by one to three characteristics as well as their size and population struggle to adapt and survive. It’s a game clearly in the same lineage as Evo and Dominant Species, maybe even going back to Karl Heinz-Schmiel’s Tyranno Ex while glancing sidelong at American Megafauna. But Evolution is considerably quicker and simpler – and therefore more accessible. Its concepts are clear and logical, the gameplay immediately challenging and competitive. Everyone gets a small punchboard card at the beginning of the game that represents your first species with a size and population of one on a scale that goes to six. You also get three cards that indicate various traits that can be applied to your species. Maybe they’ll have long necks, are climbers or have hard shells for protection. Or maybe they are carnivorous and eat other species for breakfast. 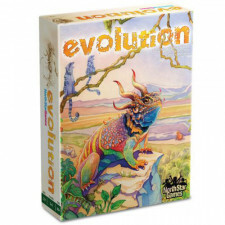 Evolution of the species is a modular affair, and finding combinations of traits that work in a given biosphere is one of the chief strategies of the game. Over the course of the game, you’ll find yourself managing multiple species with differing and sometimes synergetic qualities, which makes for quite a compelling game with few rules. Before each round, additional cards are drawn. You get three plus one for each species, which means that taking on new species also increase your options. Everyone picks one card to play face down to create a food pool for the round. Each has a food icon and a rating which may be positive or negative and the sum of cards indicates how much food is available on the big watering hole board. What follows is a once-around wherein everyone can play their evolution cards to either add traits to a species (up to three each) or discard cards to increase a species’ body or population size. You can also discard a card to start a completely new species. Cards can also be held from round to round. Once everyone has finished the cardplay segment, it’s feeding time. The food cards are revealed and plant food tokens are placed on the watering hole. In turn, everyone gets to take one food token and feed a hungry species, meaning one that has not had enough food tokens to match its population. But it gets a little tricky, because some species can get bonus food due to their traits and shortages can mean deciding between feeding one species while starving another. And then there are carnivores. Species with the carnivore trait aren’t interested in peacefully munching at the salad bar. They’re out for meat. If a carnivore species is bigger (i.e. has a higher size rating) than another, they can feed on the weaker one. There are a number of defensive traits that prevent meat-eaters from preying on smaller animals and it is also possible to feed your carnivores with your own species…or to breed smaller species specifically to keep the predators well-feed. Once everyone is fed, all of the food tokens are removed from the species boards and placed in these fine, screen-printed bags for each player. These are points. The more your animals eat over the course of the game, the higher your rate of success will be. You also get points for each animal you have at the end of the game. Now here’s the thing that may not be immediately apparent about all of the above. This is actually a subtly intricate, smartly designed game that richly conveys specific biological themes. Evolution is very much about how different types of animals impact each other in a biosphere. Playing this game leads to “aha” moments when you see how a very large, apex predator type animal weeds out the smaller, weaker animals and leads to other animals developing defenses and getting bigger. There are specific traits that generate symbiotic relationships between your species for protection and food-gathering. When there isn’t enough food to go around, animals tend to be in smaller population groups. Especially thriving animals remain on the board for turn after turn, continuing to earn points and adjusting to the changes introduced by other species – and other players. This is a highly interactive card game, so those expecting it to be a multiplayer solitaire, tableaux-building affair should be warned. The carnivores allow you to directly attack and impact other players. Setting your animals up to get more food that your standard ration and starve others out is a more indirect way of attacking. And if you’ve got carnivores in your stable or if you think you can get by on the food that is currently in the watering hole, you can play those negative food cards to actually reduce the available sustenance. But every player might have a different approach. Some may go for big animals with low population. Some might focus on building up just a small number of species while others spread more laterally. Aggressive players might control the tempo with meat-eaters for a few turns, at least until defense cards make them less viable in the current environment. More passive players will look for hardier species, keeping the watering hole full, and capitalizing on feeding bonuses. There’s a wide range of ways to succeed, and it all depends on what animals are on the table and how they are being played. It’s highly suitable as a family or gamer game. Although the rules are simple, it can get quite complicated with managing several different species and reacting to those of others. Fortunately, a limited number of trait types keeps things fairly easy to parse and the underlying logic of how things work holds it all together. That said, I can’t help but wish there were more traits in the game if only to increase the already huge range of possibilities and to create more surprise. There aren’t necessarily dominant strategies or particular upgrade pathways that are out of balance, but after several games some patterns do tend to emerge. What I would really like to see in future expansions is something like the Dominion model, where the card pool is built from subsets of traits so that each game features a different range of options. There is a Flight expansion on the way that I think looks really exciting, but it’s not like you’re going to wear out what is in the $40 box any time soon. This is a very complete title that offers a great theme (not just a setting), surprising depth and it plays two to six players in around an hour yet it is definitely richer and more robust than the “micro-games” of the past couple of years. It’s also an attractive, well-produced game. I love the illustrations because they remind me of any number of dinosaur and wildlife library books that I read back in the early 1980s. I went into Evolution interested primarily because I like this kind of theme, being a dinosaur kid and all that, but wasn’t sure it was going to deliver on it. But every time I’ve played it I’ve said “damn, that is a really good game” while packing it in, and that’s the sign of a quality design. It always manages to surprise me with its brilliantly clean, well-considered mechanics and its unusually specific approach to conveying subject matter. This is a great card game, and one of the best I’ve played in some time.